Imagine you could have a chat with your grandest of great great grandchildren today, what would you wish to tell them? Yourbot is an Android device with speech-to-text conversation engines which allows our future generations the ability to interact with and understand their ancestors of today. Through both a mobile and web app and a series of optional daily questions, Yourbot builds and stores the large and robust digital user personas for generations to come. 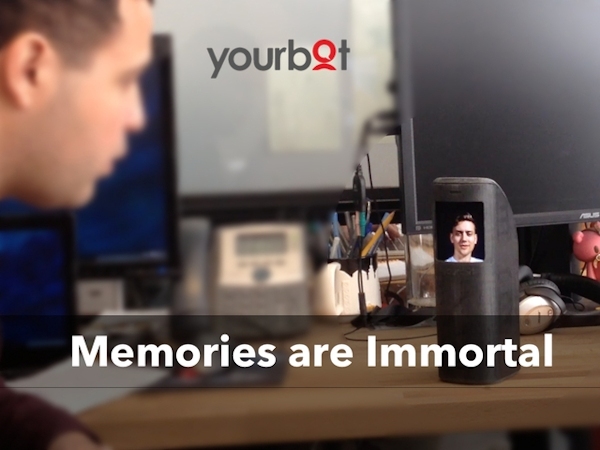 In order to accomplish their ambitious goals of digital immortality, Yourbot’s founders have decided to raise the funding through Kickstarter. The company is seeking an ambitious $100,000 project goal to bring their futuristic dream come to fruition. The Kickstarter campaign launched just yesterday and already accrued $11,595 of its $100,000 goal. Through a series of questions spanning all aspects of the human experience curated by researchers at Princeton University, Yourbot creates your own, unique digital personality to pass along throughout the ages. Imagine your ancestors from long ago. What wouldn’t you give to know their stories, to understand those who came before you? With Yourbot this impossibility becomes a reality for future generations. Many years from now loved ones yet unknown will be able to ask their ancestors the probing pieces of the past we all seek. Yourbot works through an advanced voice recognition system coupled with a state-of-the-art conversational engine to allow individuals of the future the ability to actively converse with their ancestors to ask about their experiences they have accumulated during their lifetime. According to the company: “Recording a video or snapping a pic are pretty common practices for preserving memories, but they all fall short of storytelling. The most basic human fascination of sharing tales of old is now possible. Rather than merely watching stories unfold, generations from now will be able to control the conversation, creating a truer sense of unity and understanding with long lost loved ones of today”. Yourbot is much more than just the latest technology device to store one’s memories, it’s a time machine for the future. The Yourbot Foundation is dedicated to creating a treasure trove of personal experiences and is committed to storing and advancing the precious data for at least 200 years into the future. Devoted to preserving the past while creating the future, Yourbot was inspired by the age old human fascination with storytelling, and developed alongside researchers at Princeton University. The company wants to help users to share their experiences and loves of a lifetime with future generations interested in uncovering the secrets of their ancestors. Your great, great, great grandchildren will have the opportunity to uncover their heritage and understand their past. If you’re interested in joining in the movement and preserving your life and memories for future generations, or just want to learn more, you can check out Yourbot’s Kickstarter campaign. There are Early Bird specials for future focused backers interested in getting immortalized, ASAP.